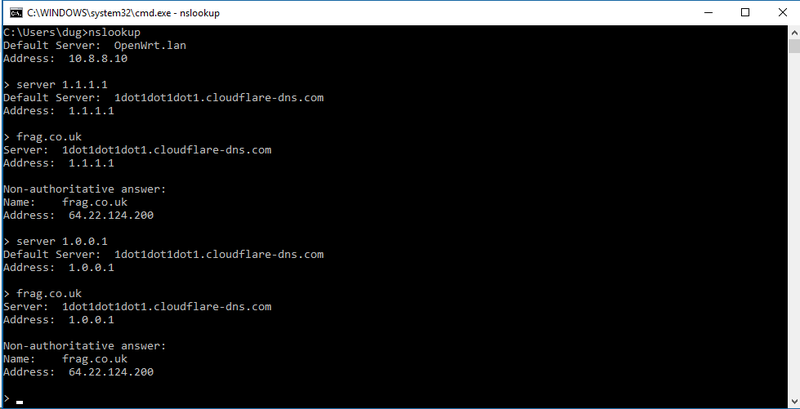 Home »All Articles » Are Cloudflare to start their own Public DNS? Are Cloudflare to start their own Public DNS? It’s heavily rumoured that Cloudflare will soon be announcing a Public DNS server. Their website, every1dns.com is currently empty, but Google have a cached version of the site available. The two DNS servers, easier to remember than Googles are said to be 1.1.1.1 and 1.0.0.1. According to their website, both support encrypted DNS as well as DNS over HTTPS. They claim they have retained KMPG to audit our systems annually to ensure that they never log your IP address. Reports are that this is very quick. So why would you use this? Public DNS is so that your internet connection can lookup which server can connect to. Each DNS server is connected to the root servers (and sometimes each other) to eventually find the IP address for the website you’re looking to access. Most home users will likely be using their ISP’s DNS server, and this can be a concern. Some problems are with privacy, as whoever yo use could be logging which sites you’re looking up. In other situations, particularly in the UK, the ISP Talktalk blocks all connections to the support program Teamviewer. This is because of widespread abuse with callers pretending to be a support company before encrypting their computer and/or asking for money. The easiest way to get around this is to use a different DNS server as this currently avoids their blocks to the Teamviewer server. This is far quicker than calling Talktalk who have a habit of accidentally switching it back on at the worst possible moment. Google also provide their own servers on 8.8.8.8 and 8.8.4.4 with more information available on the Google Public DNS website. These two DNS servers, easier to remember than Googles are said to be 1.1.1.1 and 1.0.0.1, with more information presumably coming soon at every1dns.com.